"Walk Like a Man (song)" redirects here. For other songs with the same title, see Walk Like a Man (disambiguation). (1962) "Walk Like a Man"
(1963) "Ain't That a Shame!" 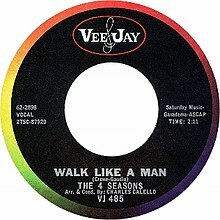 "Walk Like a Man" is a song written by Bob Crewe and Bob Gaudio and originally recorded by the Four Seasons. During the sessions that produced the hit recording, the fire department received an emergency call from the Abbey Victoria Hotel (the building that housed the Stea-Phillips Recording Studios). As producer Bob Crewe was insisting upon recording the perfect take, smoke and water started to seep into the studio; the room directly above the studio was on fire, but Crewe had blocked the studio door. He continued recording until a few firemen used their axes on the door and pulled Crewe out. Cover versions of the song have been recorded by other musicians such as the Mary Jane Girls (1986), Divine (1985), Dreamhouse and Jan & Dean (1963) off the album Jan & Dean Take Linda Surfin. Plastic Bertrand did a cover version in French, entitled C'est Le Rock 'n' Roll (1978) and Hungarian band Bon Bon also covered the song with the title Sexepilem (1999). The song features prominently in the 1996 film Sleepers. It also features in the 1993 film Mrs Doubtfire. The song "Walk Like a Man" is part of The Rock and Roll Hall of Fame's 500 Songs that Shaped Rock and Roll list. "T Shirts and Tight Blue Jeans"
(1984) "Walk Like a Man"
Divine covered "Walk Like a Man" and released it as a single from the album Maid in England in 1985. ^ Roberts, David (2006). British Hit Singles & Albums (19th ed.). London: Guinness World Records Limited. p. 210. ISBN 1-904994-10-5. ^ Eddy, Chuck (15 January 2012). "The 25 Best "Bad" Cover Songs – 9. Divine "Walk Like A Man" (1985)". Complex. Retrieved 31 March 2015. ^ Kent, David (1993). Australian Chart Book 1970–1992 (illustrated ed.). St Ives, N.S.W. : Australian Chart Book. p. 91. ISBN 0-646-11917-6. N.B. The Kent Report chart was licensed by ARIA between mid 1983 and 19 June 1988. ^ Divine - Singles Media Control Charts. Retrieved 2010-06-12. ^ Divine - Discography Swiss Charts Online. Retrieved 2010-06-12. ^ "Divine". chartstats.com. Archived from the original on 2012-12-05. Retrieved 2010-06-12. This page was last edited on 24 March 2019, at 18:45 (UTC).